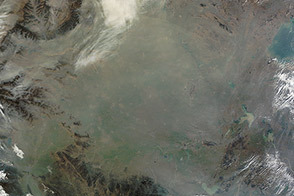 Fog and haze blanketed the North China Plain on January 10, 2012, making travel difficult. The Beijing airport cancelled 43 flights and delayed 80 more in the morning hours, when visibility dropped to 200 meters, according to state news reports. Provinces across the plain reported low visibility. 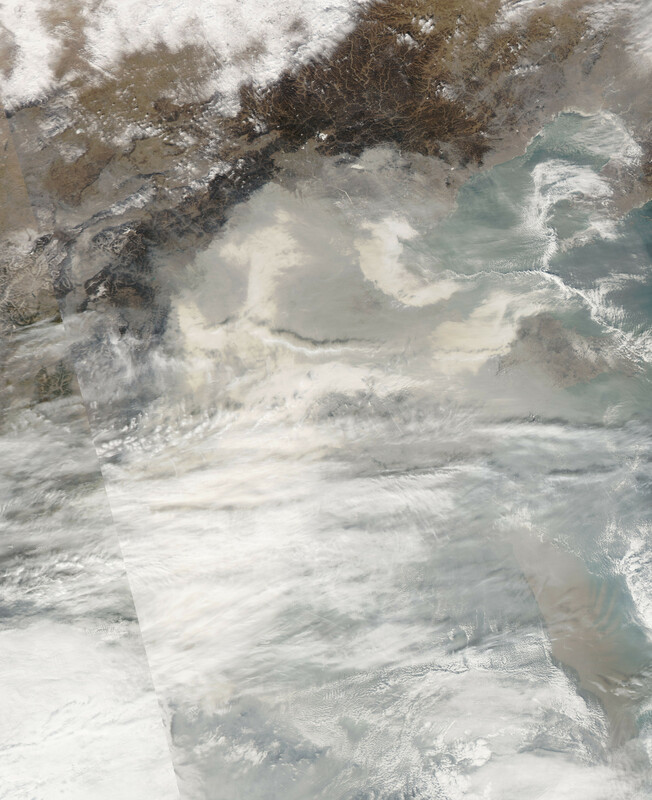 The haze decreased visibility in satellite images too. 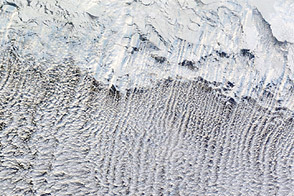 A milky, gray pall entirely blocks the ground from view in the top image, taken in the early afternoon by the Moderate Resolution Imaging Spectroradiometer (MODIS) on the Aqua satellite. 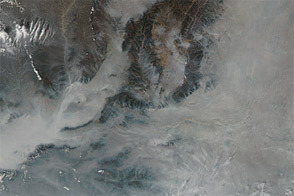 Patches of white fog or low cloud hang below the gray haze. Winds had already begun to push the haze out of Beijing in the north, but the rest of the North China Plain still suffered from poor air quality. 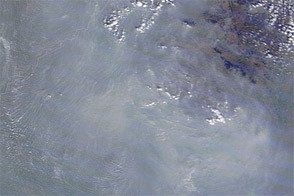 By the next day, when Aqua MODIS acquired the lower image, skies were mostly clear across the region. One major constituent of haze is particle pollution, such as dust, liquid drops, and soot from burning fuel or coal. Particles smaller than 10 micrometers (called PM 10) are small enough to enter the lungs, where they can cause respiratory problems. The density of PM10 reached 560 micrograms per cubic meter of air on January 10, said the Beijing Environment Protection Bureau. By contrast, U.S. cities exceed air quality standards when PM10 concentrations reach 150 micrograms per cubic meter. But most of the pollution that makes up haze isn’t PM10; it’s finer particles, smaller than 2.5 micrometers in diameter (PM2.5). These particles can embed themselves deep in the lungs and occasionally enter the blood stream. The fine particles are highly reflective, sending sunlight back into space. The Chinese government does not currently measure PM2.5, but the U.S. Embassy in Beijing reports their measurements hourly in a Twitter feed. On the morning of January 10, PM2.5 measurements were off the scale, though by afternoon they had dropped to moderate levels. The Beijing Environmental Bureau will start releasing PM2.5 measurements sometime before January 23, the Chinese New Year. 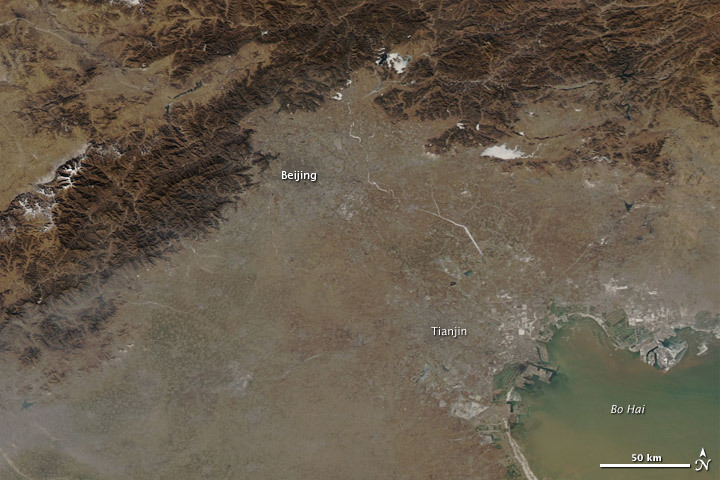 The Chinese government is implementing a plan to monitor PM2.5 across the nation by 2016. Even with improved monitoring, winter haze events may be difficult to control. One common cause of poor air quality in the winter is a temperature inversion in which a layer of cold, dense air gets trapped beneath a more buoyant layer of warm air. As long as the temperature inversion persists, pollution builds in the trapped pocket of air near the ground. 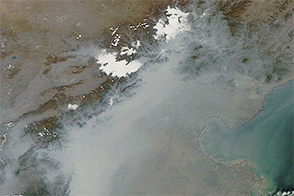 Such inversions often contribute to poor winter air quality in the Beijing region. 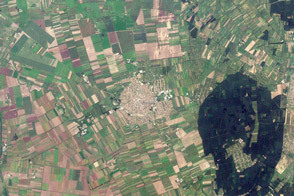 NASA images courtesy the LANCE/EOSDIS MODIS Rapid Response Team at NASA GSFC. Caption by Holli Riebeek. 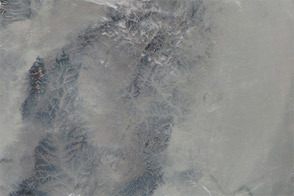 A common winter woe, dense haze halted or slowed travel across the North China Plain on January 10, 2012. 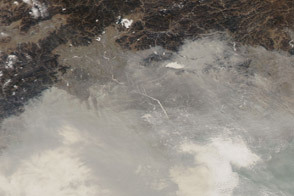 Haze filled the skies over eastern China in early January 2012. Lina, Y. (2012, January 11). Beijing city to release real-time air-quality data for local residents. Xinhua. Accessed January 12, 2012. Shasha, D. (2012, January 10). 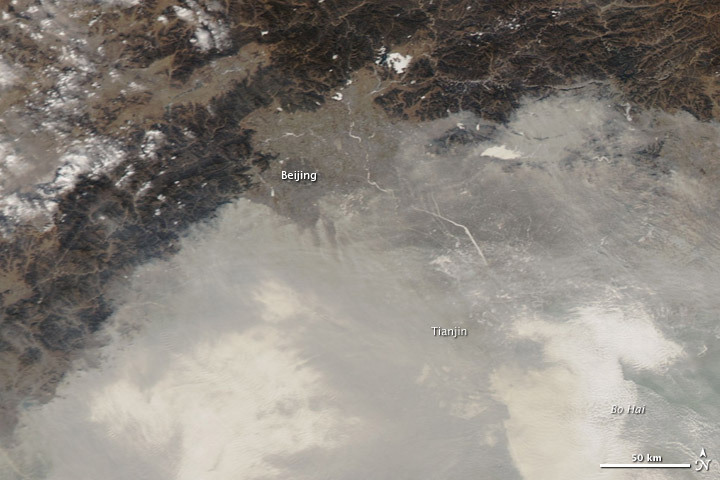 Heavy smog grounds flights in Beijing. Xinhua. Accessed January 12, 2012. United States Environmental Protection Agency. (2011, July 6). National Ambient Air Quality Standards. Accessed January 12, 2012. United States Environmental Protection Agency. (2011, July 6). Particulate matter. Accessed January 12, 2012. Wheeler, C. (2012, January 3). 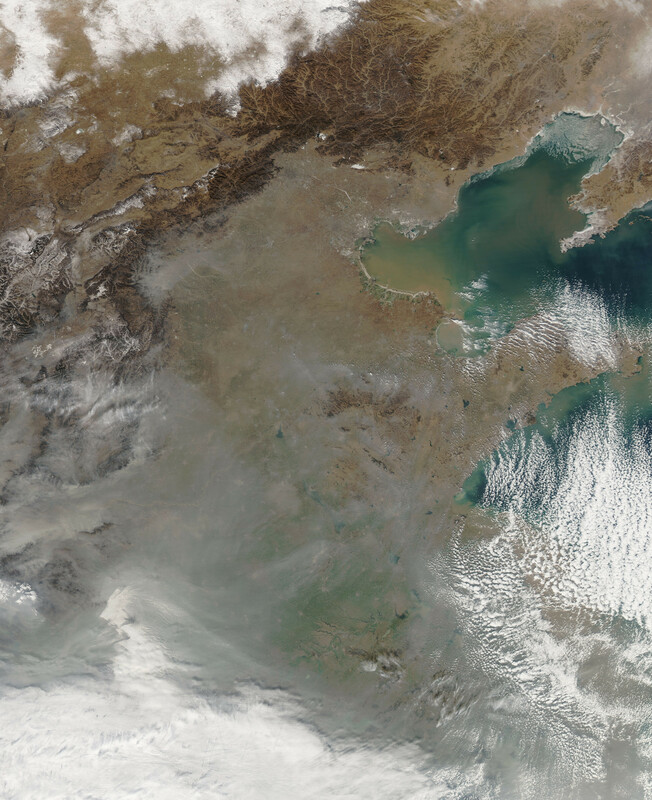 Air pollution hazardous to China’s economic health. The Globe and Mail. Accessed January 12, 2012. Xinhua. (2012, January 10). PM2.5: Easy to monitor but hard to control. Accessed January 12, 2012.